Grimsey is the northernmost inhabited part of Iceland. It has an area of 5,3 km² and is situated 41 km north of the main island. 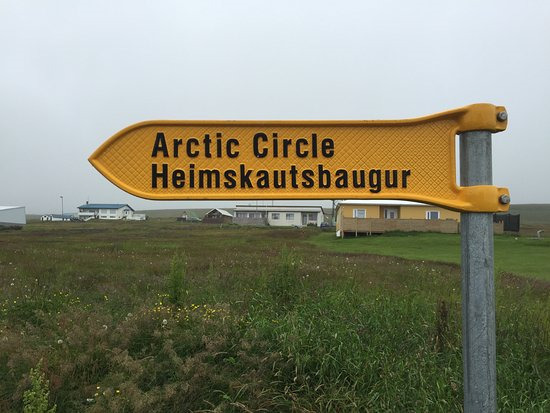 The Arctic Circle crosses it and the sun does not set there at summer solstice. The island is framed with precipice except the southern part and its highest point is 105m. Although the island is on the Arctic Circle, the weather is relatively mild: The average temperature of the coldest month, January, is -1,1°C and the warmest, August, +8,3°C. Grimsey is a community with about 100 inhabitants, who base their livelihood almost solely on the fisheries but also on limited agriculture and the bird cliffs, which saved them several times from famine and the scurvy grass growing there from scorbutic disease. Polar bears have often appeared on the island, being brought there by the drifting ice flows from Greenland. When it happened in 1969, one polar bear was shot and is preserved stuffed in the district museum in the village Husavik.